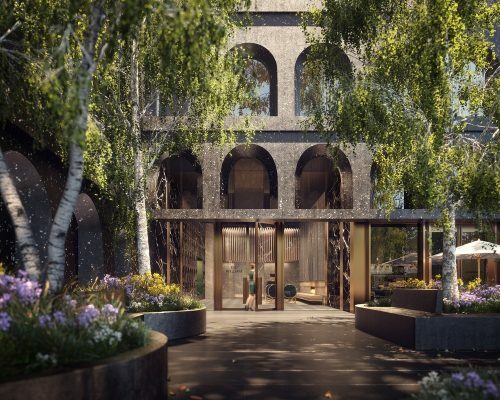 Lightstone, one of the largest and most diversified privately held real estate companies in the United States, and Adjaye Associates, the world-renowned architecture firm founded by Sir David Adjaye, announce 130 William, a luxury condominium building located in downtown Manhattan. 130 William is Adjaye Associates’ first condominium tower in New York City. It will feature 244 residences and rise 66 stories to make a bold architectural statement and unique addition to Manhattan’s iconic skyline. Recently knighted by Queen Elizabeth II and named one of TIME’s 100 most influential people of 2017, Adjaye is recognized as one of the leading architects of his generation. His firm has designed culturally significant and genre-redefining developments around the world, including the Smithsonian Institution’s National Museum of African American History and Culture on the National Mall in Washington DC, which opened last year, and the recently announced National Holocaust Memorial and Learning Centre in London, UK. “The design for 130 William acknowledges the tower’s location on one of the city’s earliest streets. 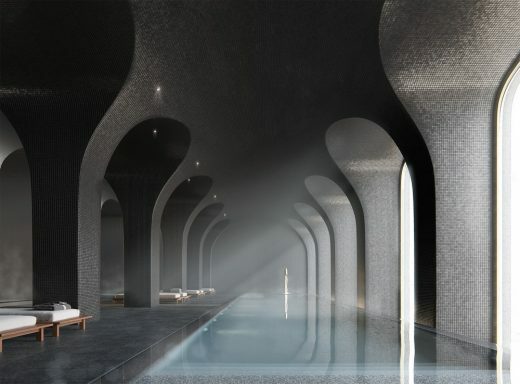 Understanding that rich history, I was inspired to craft a building that turns away from the commercial feel of glass and that instead celebrates New York’s heritage of masonry architecture with a distinctive presence in Manhattan’s skyline,” said Adjaye. Adjaye Associates is designing the architecture and interiors for 130 William. The building’s design celebrates its lower Manhattan context, home to some of the world’s most iconic skyscrapers, by evoking the neighborhood’s history and timeless craftsmanship. Its façade is an elegant balance of textured handcast concrete with smooth, delicate bronze detailing. One of the building’s signature features is a unique silhouette of rhythmic, large-scale arched windows, which draw inspiration from the beloved lofts that once populated the area. The building also features a generous new public plaza park, providing a transition between the bustle of urban life and the respite of the residences. “Sir David Adjaye is one of today’s most preeminent architects and we are thrilled to be collaborating with him to bring an iconic building to downtown Manhattan. 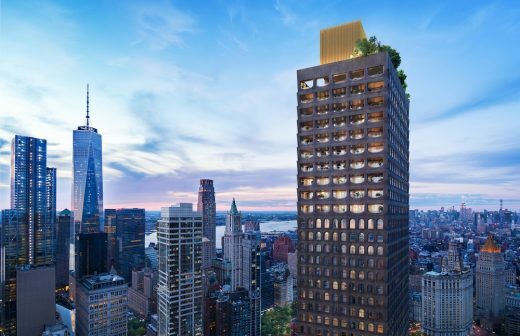 The design for 130 William simultaneously embraces the architectural legacy of Manhattan’s downtown neighborhood, while offering luxury condominium residences that discerning buyers will find is unlike anything on the market,” said Lightstone President Mitchell Hochberg. 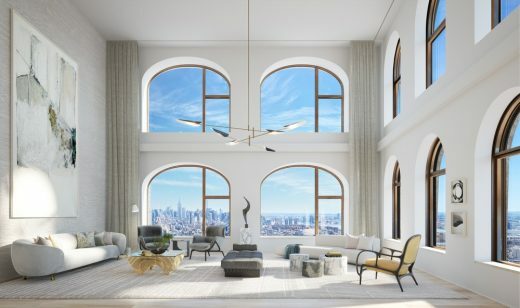 Expansive arched windows ensure that natural light floods the interiors, and residences feature luxurious materials sourced from around the world. Spacious Penthouse loggias with double height ceilings blur indoor and outdoor life while providing sweeping views, river to river, across the city. The building will offer studios to five-bedroom homes, along with a curated collection of lifestyle and wellness amenities. 130 William will include a health club with full spa, swimming pool, cold and hot plunge pools, sauna and massage rooms, as well as a state-of-the-art fitness center with a yoga studio and basketball court. The building will also feature a private IMAX movie theater, golf simulator, resident lounge, club and game room, a chef’s catering kitchen with a private dining area, children’s play rooms, pet spa, outdoor terraces, and a private rooftop observatory deck located at the top of the building, nearly 800 feet in the air. Hill West is the Architect for 130 William and Corcoran Sunshine Marketing Group is exclusively handling sales and marketing. Sales are expected to start Spring 2018. Construction is already underway, with initial closings anticipated to commence in Spring 2020. Founded in 1988, David Lichtenstein has gown Lightstone to one of the most highly-regarded and diversified privately-held real estate companies in the United States. With holdings in 28 states, operating in all sectors of the real estate market, Lightstone’s existing $2 billion portfolio currently includes over 6 million square feet of office, retail, and industrial commercial properties, as well as 15,000 residential units, and 3,600 hotel keys. Lightstone also owns over 12,000 land lots across the country. Headquartered in New York City, Lightstone maintains a presence in key markets across the country, with regional offices in Detroit, New Jersey and Las Angeles. With a key focus on new development, Lightstone continues to grow its portfolio with an additional $2.7 billion currently under development in the residential and hospitality sectors. Concentrated in New York City, Los Angeles, and Miami, these projects total over 1200 residential units and approximately 2200 hotel keys. Adjaye Associates was established in June 2000 by founder and principal architect, Sir David Adjaye OBE. Receiving ever-increasing worldwide attention, the firm has offices in London, New York, and Accra and completed work in Europe, North America, the Middle East, Asia, and Africa. The firm’s largest project to date, the Smithsonian Institution’s National Museum of African American History and Culture, opened this past fall on the National Mall in Washington D.C. and was named Cultural Event of the Year by the New York Times. Further projects range in scale from private houses, exhibitions, and temporary pavilions to major arts centers, civic buildings, and masterplans. Renowned for an eclectic material and color palette and a capacity to offer a rich civic experience, the buildings differ in form and style, yet are unified by their ability to generate new typologies and to reference a wide cultural discourse.